The 29 floors of the Riu Plaza New York Times Square Hotel stand out because of their cutting edge and elegant design and their more than 600 rooms perfectly equipped with a mini refrigerator, desk, television with multimedia connections, central air conditioning and heating, among other amenities, which have been designed to offer you maximum comfort. Included among the hotel's facilities you will find the Fashion restaurant and the Capital bar, with its Grab & Go concept characteristic of the city. In addition, the facility fee includes access to the cloakroom, a water bottle in each room, unlimited access to the gym and several other services. 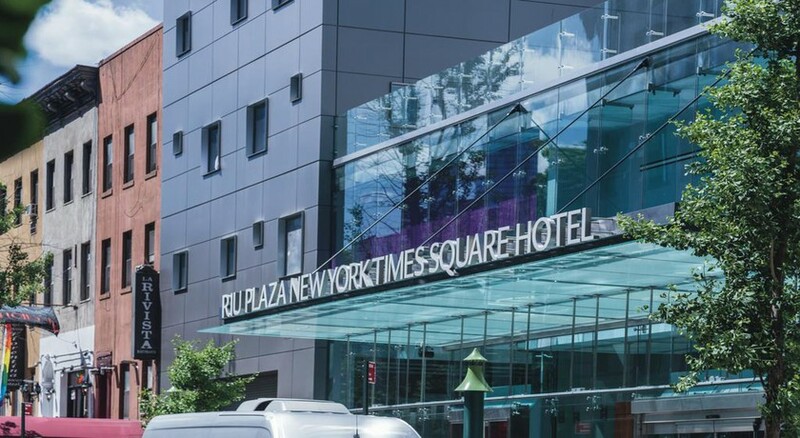 If you want to have a real adventure and discover New York's major neighborhoods and hidden gems, Riu Hotels & Resorts' new hotel is the best choice since it is located close to the city's main subway lines which cover all of the Big Apple's boroughs. The 7 train, which is only 6 minutes from the hotel, will take you to Queens where you can visit Long Island City, the borough's most fashionable neighborhood; the A and C trains, just a quarter mile from the hotel, will take you to Brooklyn where you can visit Prospect Park; and, lastly, the 3 train, which is 6 minutes from the hotel, will take you to the Bronx and the ferry which will take you to Staten Island where you can take in the spectacular views of the Statue of Liberty. As you can see, just a few steps beyond the hotel you will have access to all of New York. The 29 floors of the Riu Plaza New York Times Square Hotel stand out because of their cutting edge and elegant design and their more than 600 rooms perfectly equipped with a mini refrigerator, desk, television with multimedia connections, central air conditioning and heating, among other amenities, which have been designed to offer you maximum comfort. Included among the hotel's facilities you will find the Fashion restaurant and the Capital bar, with its Grab & Go concept characteristic of the city. In addition, the facility fee includes access to the cloakroom, a water bottle in each room, unlimited access to the gym and several other services. 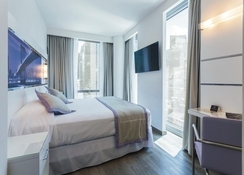 If you want to have a real adventure and discover New York's major neighborhoods and hidden gems, Riu Hotels & Resorts' new hotel is the best choice since it is located close to the city's main subway lines which cover all of the Big Apple's boroughs. The 7 train, which is only 6 minutes from the hotel, will take you to Queens where you can visit Long Island City, the borough's most fashionable neighborhood; the A and C trains, just a quarter mile from the hotel, will take you to Brooklyn where you can visit Prospect Park; and, lastly, the 3 train, which is 6 minutes from the hotel, will take you to the Bronx and the ferry which will take you to Staten Island where you can take in the spectacular views of the Statue of Liberty. As you can see, just a few steps beyond the hotel you will have access to all of New York. This is a modern building. This hotel is perfectly situated for all you wish to do. The rooms were ideal and very clean. Breakfast was one of the best I’ve had.